After seventeen years serving in the Australian Army, Ash returns to his childhood home in the outback town of Quorn. Filled with the desire to live a happy life in peace and with loved ones, Ash is grimly determined to beat his PTSD and tackle his flashbacks. What Ash isn’t prepared for is Jaxon, the new librarian in Quorn. Jaxon is calm, gentle, kind, and a rock for Ash’s battered psyche. Ash finds himself falling for the handsome newcomer, even as his mind and memories of the past torment him. When he has the idea for a mobile library to bring books and entertainment to remote communities in the far north, Ash is delighted that Jaxon is with him every step of the way. But though the library, called Book, Line, and Sinker, takes off, Ash’s past continues to plague him. Can Jaxon’s love be enough to keep them together until Ash is strong enough to stand on his own? from being in one position for so long. “That was quick.” Ash grinned. “I know.” Ash grabbed the rest of the pile and stood. “She’s a bloody genius.” Ash followed Jaxon as he went to the counter, where a large cardboard box sat. An elderly woman was carefully packing it with paperbacks and a few hard covers, and Ash and Jaxon set their armloads of books down beside it. “That’s a lot of books, boys,” the lady said with a warm smile on her face. “Reading is awesome,” Jaxon said. “Sorry, love, a gentleman cleaned out our DVD stock last week,” the lady said. “I’ll pay for it. It’s all good.” Ash made a little shooing motion with his hands. Evie rolled her eyes at him. L.J. loves to read complicated plots and hopes to do complex plot lines justice in her own writing. She writes paranormal, historical, urban fantasy, and contemporary Australian stories, usually m/m romance and featuring m/m erotica. She has won a Rainbow Awards Honorable Mention and another award for Best Historical Gay Novel. 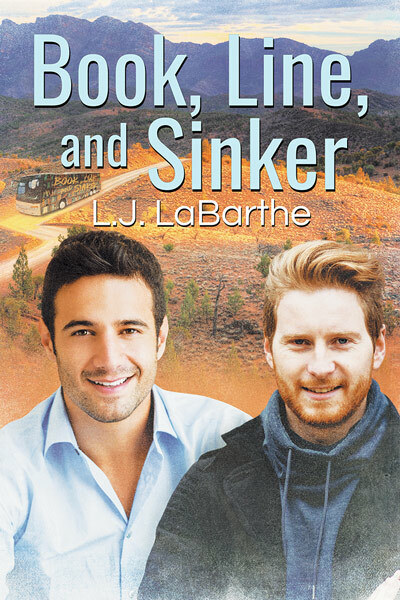 This entry was posted in Book Reviews, Books, Contemporary fiction, Dreamspinner Press, eBooks, LGBTQ Book Reviews, M/M Book Reviews, M/M Contemporary Fiction, M/M Fiction, M/M Romance, Uncategorized and tagged author guest blog, author L. J. LaBarthe, Book Line and Sinker by L.J. LaBarthe, Dreamspinner Author Tour, gay fiction.